Stamp Concrete Calculator is a multi-function calculator allowing you to easily calculate the amount of color, release, sealer, and overlay mix for stamp concrete and overlaid concrete. Additionally, this app provides calculations for concrete countertops and concrete stain. This calculator is specifically designed for Butterfield Color® products. This app is for informational purposes and Appco LLC is not affiliated with Butterfield Color® or its products. 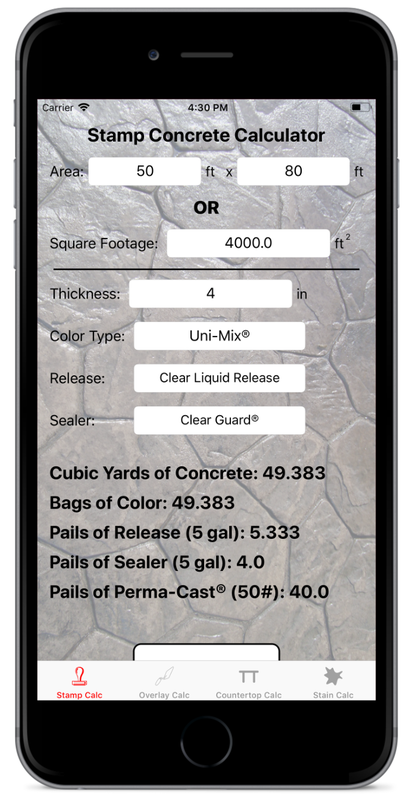 Quickly and easily calculate how many yards of concrete you will need for your next stamping job. The stamp calculator with also determine exactly how many bags of color, pails of release and pails of sealer you will need. Using Perma-Cast®? The stamp calculator has you covered. Never know how many bays of overlay to buy or what thickness to put it on? The overlay calculator gives the recoomended thickness range and allows you to specify how thick you want to place to ensure you always have enough material for your job. Applying stain? Overlay calculator has you covered. Concrete countertops look great, but you want to ensure you have enough material to get your desired thickness. Using the countertop calculator you will ensure you have the correct amount of bags, pails of polymer, and number of color packs to ensure you get a great countertop each time. Stamp Concrete Calculator also supports calculations for staining slabs. Using the area or dimensions of your slab you can ensure you always have enough stain, sealer, and cleaner.